This entry was posted on March 16, 2015 by Jessica Anderson. 1. What criteria do you use to choose your winner each month? 2. Is the criteria tied to your company values? 3. What happens if more than one person meets the criteria? 4. How transparent is the process to your employees? Once you establish the metrics for choosing your monthly winners and communicate them to your employees, the next hurdle is implementation. It's important if you start a program, you follow through until a specified date. At that time, you can re-evaluate the program to make sure it enhances your company vision, mission and goals. Many customers who administer employee of the month programs ask our advise on what kinds of awards are appropriate for the monthly winners. Below are our suggestions. We offer many different styles of perpetual plaques, including styles that hold photos of your winners! Most companies display, on a highly visible wall, a perpetual plaque with the names of their monthly winners. This is great public recognition for not only the winners, but also for the program. Two popular plaque choices are the beautiful rosewood 12 or 24 Plate Perpetual Gloss Plaque or the Black and Silver Perpetual Plaque. At Trophies2Go, we include the price of engraving of the large header plate on the top of the plaque. 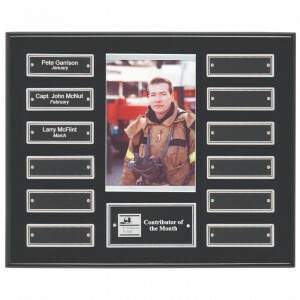 Popular engraving includes Company Name and Logo, words 'Employee of the Month' and the Year. Blank plates are included in the price of the perpetual plaque, but there is an additional fee to engrave individual names onto each small plate. Many organizations pre-pay for a year's worth of 12 individual name plates when they place their order for the plaque. Then we engrave the plate as needed, and the customer sticks or screws it onto the plaque each month. This option simplifies the ordering process. For the text on the small plates, I recommend engraving the winner's name and month of the award. If the text is short, you can also list the metric that made them the winner for that particular month. It's important to keep the engraving size, font, and style consistent from month to month so that all of the small plates match. 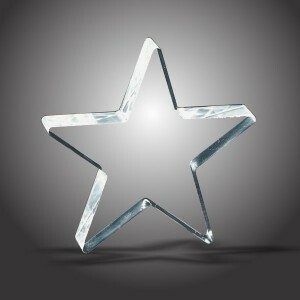 The popular Clear Acrylic Star Award Trophy makes a great, affordable Employee of the Month reward. To commemorate the achievement, many companies will give an individual employee of the month trophy to each winner. This personalized award can be displayed with pride on their desk, on a shelf in their office, or at their home. For example, a number of years ago my mother-in-law was honored as "Employee of the Month" at a large municipality where she worked. Even though she is retired, she continues to display her award on her family room shelf for all to see. Probably the most popular employee awards for this type of recognition are either Acrylic Awards or Glass Awards. Made of Lucite, acrylic awards have the look of glass but are durable and more economical than crystal. Glass awards look very professional without breaking your budget. After discussing this post with our customer service team Margene and Janice, they recommended these beautiful yet affordable awards for your monthly winners: the Jewel Mirage Self-Standing Acrylic Award, the Beveled Bent Glass Award, or the bestselling Clear Acrylic Star Award Trophy. For engraving, I would suggest etching the facts such as the person's name, the company name, the name of the award (Employee of the Month), and date (month and year), but then also add a short personalized message about their contribution to the organization. You could include why they were chosen, how they supported the vision or mission of the company or what specific action they did to win. Get as detailed as possible, as that makes the award more meaningful. Instead of, or in addition to, individual awards, companies may also give employee of the month certificates, gift cards, cash or other rewards to their winners. These are also appreciated by deserving employees! Use the tips above to update your Employee of the Month recognition program and choose the perfect plaques and awards for your winners. It's never too late to start honoring deserving employees!